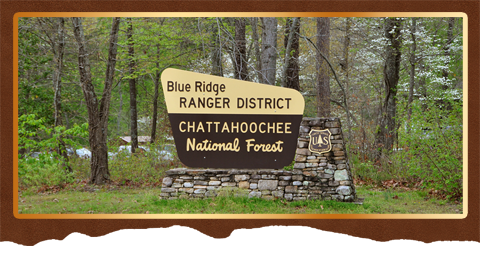 The Chattahoochee National Forest covers 749, 549.71-acres of the mountainous high country of northern Georgia and is managed by six ranger district offices. High mountains, deep valleys and river gorges, rushing waterways, magnificent waterfalls, hardwood forest and native wildflowers, wildlife, camping, fishing, small hidden lakes, fish hatchery, scenic roadways, and miles upon miles of hiking trails including a large section of the renowned Appalachian Trail. Counties within the mountainous regions of North Georgia average roughly a 50/50 ratio of public lands to privately controlled properties. It’s this abundant ratio that offers so much wealth when it comes to enjoying the great outdoors for those visiting or living in the far southwestern Blue Ridge Mountains. For more information concerning the wealth of this great forested mountain country visitors can obtain maps and other materials concerning local hiking trails, biking trails, fishing areas, canoe and boat launches and camping areas at the local district office listed below. The GPS is to take you to the District Office closet to Towns County for more information and brochures. Open Monday-Friday 8:00 a.m. to 4:30 p.m.
Closed for lunch 11:30 a.m. to 12:30 p.m.